Our new favorite North American restaurant isn’t a barbecue joint. It’s the very antithesis of live fire cooking–an uber-hip, sushi centric restaurant in Boston’s old leather district called O-Ya. But despite the predominance of raw seafood, O-Ya makes ingenious use of live fire. 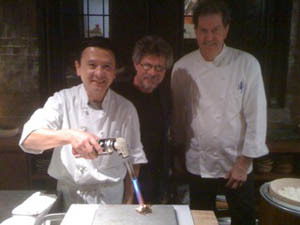 Pictured above: O-Ya founder Tim Cushman (right), Steven, and chef Hiroyuki “Hiro” Konish from Japan. So what’s the deal with the blowtorch? 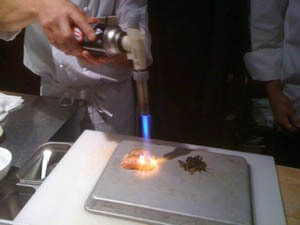 Turns out that a quick blast of fire brings the flavorful oils in the fish to the surface. The resulting smoke flavor makes this unlike any sushi you’ve probably tasted. No wonder O-Ya was Food & Wine Magazine’s restaurant of the year last year.